What is the Oldest American Folksong? What’s the oldest English-language American folksong? If you heard it sung today, would it still be meaningful? I don’t mean a song that was sung in another land before it came to North America. And I don’t mean a song composed by the Indians who lived in North America for the last fifteen or twenty thousand years. What’s the oldest song we know about today, that was made up by English-speaking colonists in the British colonies in eastern North America? “Yankee Doodle” would be a good guess; its familiar melody had been popular in a number of Western European countries for centuries. At a time in history when people made their own music, songs were one of many ways American colonists could express their dissatisfaction with their British rulers across the Atlantic. British soldiers responded with songs ridiculing the colonists as country bumpkins, one of which told of a Yankee simpleton (a “doodle”). It became so popular that the British troops played it as they marched to battle on the first day of the Revolutionary War. The Americans claimed the song as their own and composed verses ridiculing the English and lauding George Washington. By the time the English surrendered at Yorktown in 1781, “Yankee Doodle” had become the unofficial national anthem of the new nation. Today, it’s the state anthem of Connecticut. Elementary school students sing it at schools in fifty states. In colonial times, the Township of Springfield Mountain lay some eighty miles west of Boston. In the 21st century, the community is called Wilbraham, Massachusetts. The local telephone directory is still full of people with the last name of Merrick. Their Welch ancestors settled in Western Massachusetts in the 1680s. Before the American Revolution, there lived in Springfield Mountain a local farmer by the name of Thomas Merrick. He later served as a Lieutenant in George Washington’s continental army. In early August of 1761, farmer Merrick observed that the hay in his field was ripe and ready for mowing. It had been an extremely dry summer. Winters in western Massachusetts were particularly hard. Without an ample supply of dried, bailed hay, his livestock would starve when the deep snow covered the ground. So, on a hot and humid Friday, farmer Merrick sent his twenty-two year-old son, Timothy, to harvest the hay. Timothy, like other young men and women in that agricultural community, were accustomed to the hard labor of subsistence farming. He sharpened his father’s scythe blade against a stone. He then began the laborious task of cutting the hay, but his thoughts were elsewhere. In keeping with the customs of the time, Timothy and his betrothed spent little, if any, time together un-chaperoned. So, he may have had other things on his mind. Perhaps, this is why he didn’t see the rattlesnake. And it bit him. Nobody responded to his calls for help and, a few hours later, he died. Many local farmers had their own fields to mow and the news of Timothy’s death sent feelings of dread through the sons and daughters of the community. The snakebite that killed Timothy Merrick was, in fact, one of the last recorded snakebite fatalities in that area; it was not a common occurrence. Four years later, a poem about the snakebite incident appeared in Joseph Fisk’s versified Ten Year Almanack, a book that chronicled outstanding events of that occurred between 1755 -1764. Fisk’s book was popular in households in all thirteen colonies. Today, the folksong about Timothy’s death, “Springfield Mountain” (and its parodies) are so widespread, it is considered a traditional folksong in dozens of states and is frequently included in collections of traditional American folksongs. Leftenant Merrick’s only son, a likely lad of twenty-one. One early morning this lad did go down in the field the hay to mow. The early inhabitants of Springfield Mountain erected the Adams Cemetery in 1741, south of town, on a level meadow about half the size of a football field. They planted maple trees around the perimeter so they could locate the resting place of their loved ones, even in deep winter snows. Timothy Merrick has been resting in his grave in this cemetery, for over two hundred and fifty years. Whenever I’m touring in western Massachusetts, I visit Timothy’s gravesite. Traveling west from Boston on Highway 90 for about an hour and half, one takes the Wilbraham exit. Now part of a residential neighborhood, the Adams Cemetery is in the 1000 block of Tinkham Road. The campus of Minnechaug Regional High School can be seen across a field, just north of the graveyard. “Soon as he felt that deadly wound he dropped his scythe upon the ground. 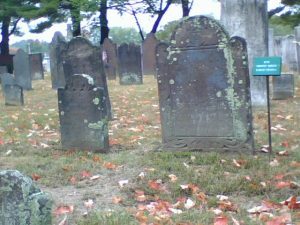 Several years ago, I visited the Adams Cemetery in Wilbraham, Massachusetts, on a frosty April morning. As I stepped among the dry and crackling maple leaves scattered before Timothy’s headstone, I turned around and discovered before me, the tomb of his father, Lieutenant Merrick. As I was looking around for Timothy’s mother Mary’s headstone, I tripped over a smaller marble grave marker in the tall weeds, just to the left of Timothy’s headstone, busting my shin most painfully. I tumbled to the ground, gripping my ankle and issuing an unintentional cry of anguish. lution, more than one out of four children never lived to see their fifth birthday. Many children would lose one or both parents before the end of childhood. In fact, there are quite a few children’s graves in the Adams Cemetery. As I lay among the dry and brittle maple leaves, inspecting my now swelling shin, I looked around self-consciously, embarrassed that my cry of pain might have startled the neighbors, so plainly in view, not more than four hundred feet away. But nobody heard me shout. “The neighbors ‘round his voice did hear, but none to him did thus appear. Thinking for workmen he did call and so alone this lad did fall. And soon his only son he found, cold as stone upon the ground. In seventeen hundred and sixty-one ‘twas this sad accident was done. I galumphed back to the rental car thinking: if it had been a rattlesnake, I would have died right there in that graveyard. Political Correctness and Traditional Folksongs: Can They Exist in the Same Time and Space?